Dorce Prefabricated Building and Construction Industry Trade Inc has successfully completed numerous international projects to date and has begun construction of five new projects in Mauritania and Iraq. The company’s general manager, Suheyla Cebi Karahan, emphasised the importance of these projects; "Dorce has the ability to follow a high quality policy under difficult circumstances in Iraq, Africa and the Middle East. Dorce will carry itself to a higher status and will introduce itself in a better way an international level with its completed projects." Dorce will be completing a total of 20 reinforced concrete and steel vehicle inspection stations in 18 cities throughout Iraq, including the construction of infrastructure and superstructure works for the Iraqi Ministry of Interior. Dorce has undertaken the consruction of a housing project consisting of a 1416 villas and 11 social structures in Basrah, Iraq. Under the scope of this project, all schools, villas, shopping, business and cultural centres will be built with reinforced concrete and Dorce will also construct infrastructure and superstructure. The project will be put into service of the Republic of Iraq, Establisment of Martyrs. Dorce will be completing its third project in Basra. A general 400-bed hospital project has been awarded to Dorce, including all infrastructure, superstructure works and technological devices. Dorce has also been executing two more important projects for the mining sector in the Guelb and Tasiast region in Mauritania. The company has become one of the initiators of business from Europe to Africa by procuring construction materials from both Turkey and Mauritania, and from countries in the region of the project areas. Both projects will be put into service in a turnkey manner. Execution of the buildings’ infrastructure and superstructure in the Guelb project area has commenced. 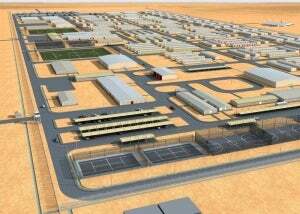 A pre-engineered 6800 turnkey workers camp will be completed by Dorce at the Tasiast project site, including all infrastructure and superstructure construction. It is known that Dorce Prefabricated Building and Construction Industry, Trade Inc has completed construction of several residences, schools, hospitals, labor camps, office buildings, embassy buildings, process buildings, hangars and workshops in Iraq, Saudi Arabia, Qatar, Yemen, Oman, Turkmenistan, Kazakhstan, Tajikistan, Pakistan, Kyrgyzstan, Azerbaijan, Iran, Afghanistan, Algeria, Libya, Cameroon, Congo, Democratic Republic of Congo, Niger, Nigeria, Cameroon, Sudan, Djibouti, Equatorial Guinea, Gabon, Albania, Kosovo, the United Kingdom, Ukraine, Russia, Australia in previous years. High investments in the project areas by Dorce. will boost import and export business, and will bring innovations, especially to Iraq and Africa, by providing solutions upon employment to the project locations.